Heading south for the winter and want to stay fit on your trip? Long car ride ahead with visions of your fitness fading and stiffness increasing? Take heart! Here are 10 Tips to Stay Fit on Your Trips that I do on long trips—as a passenger! I do my best to keep excellent upright posture with abdominal muscles tight, slightly braced, as if someone’s going to poke me in the tummy. —not sucked in uncomfortably—which can’t be maintained, anyway. Do this anywhere, anytime, all the time! For those with bone loss, always follow the safety rules of never rounding your spine forward, twisting to the point of strain, or doing very deep side bends. 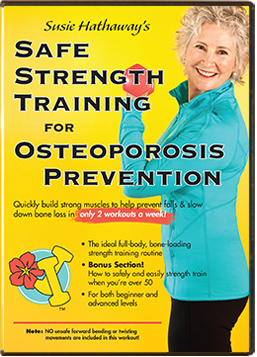 See Moving Safely at the National Osteoporosis Foundation. These moves for the car aren’t weight bearing, but they are muscle strengthening and are very beneficial for our bones. 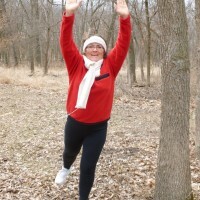 I start with “Tippy Toes”—fast little taps on the balls of my feet, in place and moving from side to side. Then, I march in place, slowly, progressing to a fast march or “jog” —but I go at a pace that I can keep up. It’s very aerobic and an arm swing can also be added. I do an adapted “bicycle” ab exercise in the space I have, leaning back a bit with back support to keep a neutral spine, —one leg goes out as the other comes in. It’s not in a full range of motion at all, but it certainly works my abdominal muscles! Keep abs tight, don’t let them pooch out. Work both sides of the body. All of the above moves work the front side of the body and core, including my lower back, which always needs and appreciates good support and attention to not strain or round it, at all. To work the back side of the leg and buttocks, with one leg slightly bent at the knee, I press a heel into the floor and hold and/or drag my foot in, pressing down throughout the move. This move contracts muscles from the foot to the waist, especially on the back side. For another back side move, see #10 below. For arms, I bring my resistance bands along. Again, the range of motion is limited, but it’s not a bad thing at all. It’s so much better than absolutely nothing while in the car. 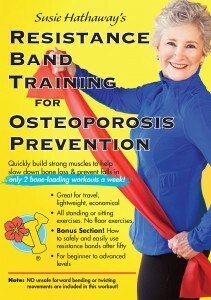 I also use my looped band around both legs or knees and press outward in a variety of ways. 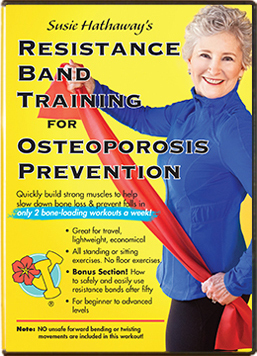 Many of the exercises in my Resistance Band Training for Osteoporosis Prevention DVD can be adapted for a small space or while seated. An Amazon Video download version is also available for your mobile devices. Prop it on your dash and get fit while you sit! I have to tell you that back in my mid-forties when I was first beginning to strength train and couldn’t bear to miss a workout, I did take my dumbbells and leg weights on car journeys and on the plane. My very fit father, who even at age 75 always insisted on carrying my bags when he picked me up at the airport, gasped with that one, “What do you have in here, rocks??! !” “Well, it’s pretty close, Dad!” Now, there’s an airline weight limit enforced, Dad’s 94, still picks me up, but I carry my own bags and use my bands on the plane…and in the car. With arms up, elbows bent, palms forward, slide chin back and squeeze together with your shoulder blades, then pull your shoulder blades down, and also press your elbows down toward your back pockets. Hold and breathe! The is a good stretch for the front side and strengthening move for the upper back and triceps on the back of the upper arm. But if you’re the driver, focus on the road!! You can always sit up tall—picture ET lengthening his neck upwards. Slide your chin back, shoulders back and pull down with the shoulder blades. Abs tight. Squeeze your gluteal muscles, your buns, to make yourself a little taller. Try it, it works! When you do get out of the car for a break, do some standing back extensions like these my neighbor is demonstrating! Arms up, press back, hold. Add lifting a leg back or lift it separately if both the arm and leg are too challenging. 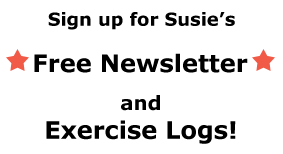 Don’t arch to do the move, but move the leg and arm independently. This one is also in my Resistance Band video. If you have a special exercise that works for you while traveling, let us know! Thanks!